A NEW revision aid for sparky schools. 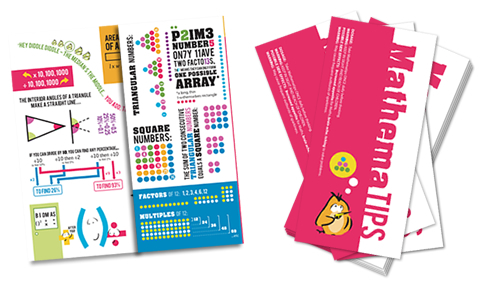 Our Mathematips revision cards have proved so popular, we are now branching out into two new resources. 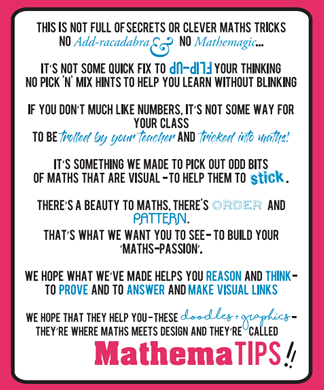 These are Mathematips revision leaflets (one per student) and the personalised Mathematips wall! At the moment, we have just produced one version of the revision leaflets, but are willing to develop a GCSE version, should the interest be there. We have limited stock, so GET IN QUICK!. 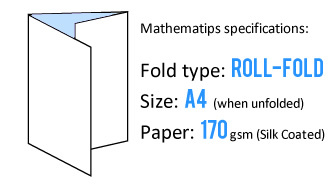 The Mathematips Revision Leaflet is an A4 roll-fold leaflet (one per student) to spark up your maths revision. 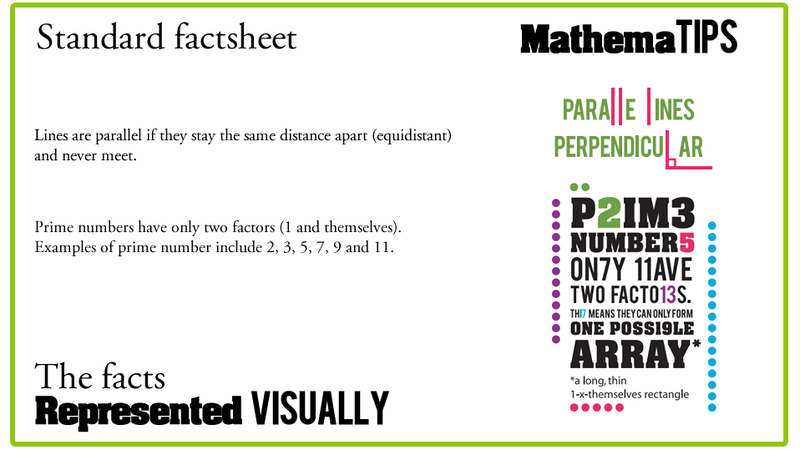 These are a design/typographical look at key maths concepts and themes. PLEASE NOTE: Although the leaflets have been designed with Y6 in mind, they do not feature the word SATs or Y6, so they can be used for any age-group and in any country. See below for the list of concepts covered. - shifting digits to multiply / divide by 10, 100, 1000 etc. As well as the leaflets, we also provide a short PDF where we briefly explain what we were thinking with each image. Our Mathematips wall is an exciting new design service we provide that is personal to your school, with the price dependent on the size of wall you want covered and the style of covering you require. Typically, we provide the design ready-printed on wallpaper that you can then apply yourself. If you are interested in finding out more, do contact us and we'll send you more details. To explain the concept to your students, we included a poem on the leaflet!